Tron Ransomware could cause a lot of trouble as the malware is capable of locking user’s private files with a secure cryptosystem. As you see the data that gets encrypted can no longer be opened as the computer cannot recognize it. Unfortunately, it might be impossible to restore it as the only tool capable of it is probably available only to the malware’s developers. The other way to restore locked files is to switch them with copies from backup storages. Thus, if you were lucky enough to make a backup before the system got infected with this infection, you should be able to get your data back. Users who do not have this option may consider paying a ransom asked by the hackers behind Tron Ransomware, but we would advise against it as it is extremely risky. To find out more about this malicious program we recommend reading this article. Users who decide not to risk their savings can also find our prepared deletion instructions located below; they will show how to eliminate this malware manually. Before we start talking about how Tron Ransomware works or encrypts user’s data and what it does, later on, we would like to discuss the ways it could enter the system. The most popular distribution channels for such threats are no doubt Spam emails and unprotected RDP (Remote Desktop Protocol) connections. This is why to keep the computer secure it is essential to avoid suspicious email attachments coming from people you are not familiar and to replace weak passwords. In addition, our researchers would advise updating outdated software, including the computer’s operating system and antimalware tool. Programs that are not up to date can have known vulnerabilities which hackers could use to gain access to the system and drop malware on it without the user even realizing anything. Another good idea would be to stay away from malicious file-sharing web pages or other potentially-dangerous websites, advertisements, etc. Nonetheless, if the malicious program enters the system, it might do quite a bit of damage. First of all, Tron Ransomware should check users IP address and then locate all targeted files. Our researchers say the infection is mostly after user’s private data, for example, pictures, photos, videos, various documents, etc. All of these files should be locked while using a secure cryptosystem. What’s more, during this process each affected document, photo, or any other file should gain a second extension visible at the end of the title, for example, panda.jpg.tron, myspeech.docx.tron, and so on. Therefore, it is not to difficult to recognize ruined data as it only takes to take a look at its title. After encrypting al targeted files, Tron Ransomware should open a warning message titled Tron. It starts with “All your files are encrypted” and continues with instructions on what to do to restore locked data. 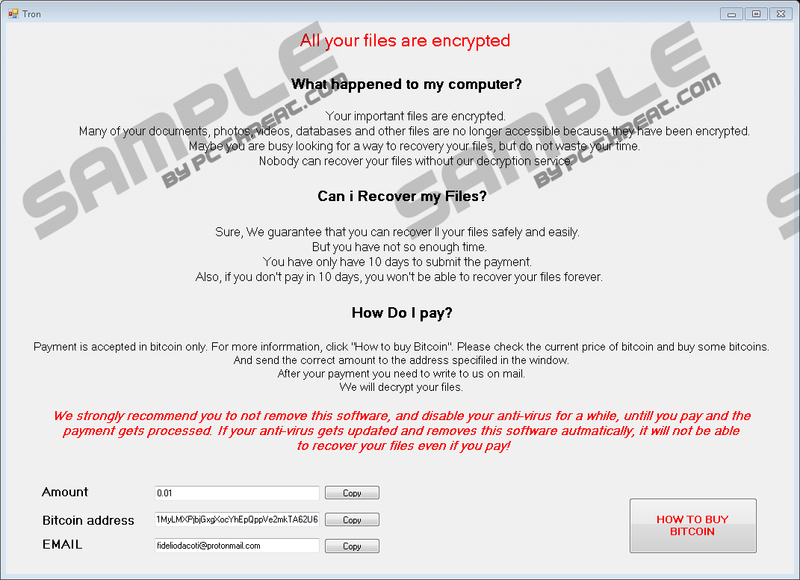 For instance, the message claims the files can be restored only in the following ten days and to do so the user is asked to pay a ransom. No doubt, this message is a ransom note written by the malware’s developers. Naturally, users who have no options for data recovery could consider complying with the stated demands and paying the ransom. However, just as we said earlier, we do not advise it. The reason for it is the hackers cannot be trusted; not to mention, there is no way of getting your money back even if your data does not get decrypted. We do not say you will necessarily get scammed, but given you would be dealing with people who make a living by constantly ruining someone’s files and extorting money from users, we believe it quite likely to happen. Consequently, we advise not to trust Tron Ransomware’s developers and get rid of the malicious program instead of paying the ransom. If you think this is the best thing to do as well, we encourage you to use the deletion instructions located a bit below. Also, users who think these steps are a bit too complicated can use a reliable antimalware tool too. Quick & tested solution for Tron Ransomware removal.